Pixel Arts Game Education’s vision is community uplift with Youth-Adult Partnerships. This places youth at the apex of agents of change. We recognize that adults must be partners to youth–we must listen and learn in order to empower youth capacities to govern, community organize, and lead. We are proud to be a founding partner of the Mythos Challenge and the Mythos Youth Council. I’m in love with art and animation. Drawing is a favorite hobby of mine, and when I find the time, I love animating. I also really enjoy astronomy, oceanography, and photography (don’t ever hand me a camera on a nature hike– I will never leave). I have the ability to fall asleep no matter where I am. I fall asleep on couches, floors, side walks, in trees and once outside of a candy store in Cannon Beach, OR. I also have a skill in being able to eat everything in the kitchen and I use it all the time. I want to write animated movies. Or animate them. Or voice in them. Or really anything to do with animated movies! It’s very much a dream of mine to write and direct an animated movie that makes it to theaters. If I were in a myth, I’d probably be in the Greek myth describing the creation of the star sign Scorpio, the giant scorpion that was sent to kill Orion. Scorpio is the star sign I was born under, so it makes sense to me. Plus, chasing down a total quack like Orion sounds like fun, and I just couldn’t pass up being a giant scorpion. My dream job is to become an environmental engineer or an environmental scientists. It connects to my passion for the environment, and after completing a summer internship it has made me want to become an environmental engineer even more than before. Three things I am really passionate about are: music, literature, and the environment. I’ve been involved with music all my life, and I plan to continue with it. Over the years I’ve learned various instruments but the main instrument I play on is the bassoon. Reading has always been a favorite pastime of mine, and it has really helped broaden my horizons and outlook on life. I’ve been volunteering at the library for five years now, and since the fall I’ve been working at the library as an employee which is an amazing experience. Being outdoors is something I really enjoy and it has influenced me to become an environmentalist. I am passionate about saving the environment, and doing what I can to preserve planet Earth. Popcorn! It has always been my go-to snack and it is easy to make. What I love most about it (besides its taste) is that it is easily customized. Caramel corn, cheese corn, buttery corn, and kettle corn. The myth I would be in would be the one with Icaurs & Daedalus. I’d like to be Daedulus because of his ingenius of craftsmanship in creating the labyrinth and the wings to escape from Crete. I picked this myth because I like how even though it seemed impossible that they would escape, with some intelligence and creativity, it happened. I also like that Icarus flew too close to the sun and fell, which shows what happens to over-ambition. Read and write and draw. I also love netflix! I am passionate mostly about art, and world problems. I don’t have a dream job, I do hope to work in technology. If I were to be a myth it’d be the one about why the seasons change. I’d be Persephone. I want to be able to get to the point where I can make money off of my artwork and stories. I know it might not be the most stable job, but hey, I’d be doing what I love. I’m really passionate about the future, and how people can help to make it easier for generations to come! But aside from that I’m also really passionate about my art and writing! I don’t have anything specific in mind, but I do want to see more games revolving around interesting gameplay instead of a bunch of dull gritty shoot em ups. A memorable game can be compared to a favorite book, but a cheap and gritty lookalike will only be remembered as such. I’ve always been fond of the story of Icarus, but maybe it’s just the idea of being able to fly. I would probably want to be his father though, Daedalus got to keep his wings and not fall into the sea! Currently, it’s anything punk/ rock (like Fall Out Boy, Panic! At The Disco etc.) as well as some indie bands/ singers. Many things. Including (but not limited to) chocolate covered pretzels, chex’s muddy buddies, yogurt and fruit. I enjoy netflix, taking pictures, reading and cosplaying. I would be in (well it’s not technically a myth so much as a fictional story) Alice and Wonderland. I would be the Mad Hatter because he’s funny and crazy and just wonderful. I don’t know why but instrumental game music just makes my day. I am passionate about art and games. I like idle games and adventure RPGs. I am a native Oregonian and what I love most about Oregon is its variant beauty. Whether I am admiring the Painted Hills or hiking along the Columbia Gorge I feel at home. I am passionate about living life to the fullest! I like to try new things and test my limits. I want to be a small business owner in East Multnomah County after I complete business school and gain experience. I’m not quite sure what services my business would render, but I know that I want to do outreach within the public schools. I aspire to be a pediatrician. I am passionate about music. I enjoy playing and hearing different varieties of music. My favorite snacks are cookies, but not raisin cookies. The thing I like most about Portland is that everyone cares about art. We have a free art museum so everyone can enjoy it. We have First Thursdays so people can view interesting galleries and forms of art they never would have known about otherwise. And we have sculptures around the city so no matter where you are, you have the reassurance that creative minds are near — you are definitely in Portland. Reading. I like reading Greek mythology and fiction based on those myths; I like reading Arthurian mythology and fiction based on those myths. That is why I first became interested in the Mythos Challenge. I especially approve of how you can have an entry centered around any legend, not just the more commonly-known lore from Greece or Rome. My favorite snack is popcorn, but Chex Mix is a close second. I would like to be in “Robin Hood and the Silver Arrow,” as Maid Marion. She knows how to be a fighter equal in skill as her husband, and a leader charging in with the women to help the battle the men were losing. This shows that girls can be heroes just as much as the classic examples of Odysseus or King Arthur. When I was five, I started learning a form of Indian classical dance called Bharatanatyam. After nine years of training, in 2012, I completed my Arangetram (or debut solo performance). Since then, dance has taken me around the world and allowed me to meet so many amazing people, so I’m always thankful for that. I also started training in Taekwondo about seven years ago. It’s a great sport, and it’s really taught me a lot about perseverance. I’ve been a Taekwondo instructor for three years now, and I’m training to hopefully get my 3rd-degree black belt next spring. I don’t have anything specific in mind, but I do know that I would like to be in a position where I can help people. I’ve considered medicine (surgery, in particular) because I think what appeals to me most is public health. I would like to work in an organization like Doctors Without Borders (or something of the sort) that would lend my job an international focus. I don’t really have any qualms about food, so I tend to eat most things. But as for my favorite…dumplings. Enough said. The Mahabharatham, which is the source of some of India’s greatest mythologies, is a very fascinating subject. While it’s quite obscure in the Western world, the epic is as central to Hinduism and Indian culture as the Bible is to Christianity. The poem itself is of ambiguous origin, but the Mahabharatham is the longest poem ever written (about ten times the length of the Odyssey and the Iliad combined). The Bhagavad Gita (a central text in Hinduism), as well as other philosophical and moral teachings, are derived from the poem. While the tale itself would take hours to recount, the basic premise is this: two warring sets of cousins (the Pandava brothers and the Kauravas) sit down to play a game of dice, and of course, the bad guys win. So the protagonists, the Pandavas, are exiled to the forest for twelve years. They, naturally, do some scheming, and decimate the Kauravas in a war following their exile. Other problems–somewhat minor in comparison–arise later (these include family drama, curses, and more fighting), but eventually, the main characters spiritually ascend and there is as happy an ending as there could possibly have been. For the sake of meeting these characters, I would’ve loved to have been in the middle of the action. Of course, a lot of clubs fly and decapitating is not an uncommon occurrence, but personally, I don’t think anyone would turn down an opportunity to jump into the rising action of one of India’s greatest epics. 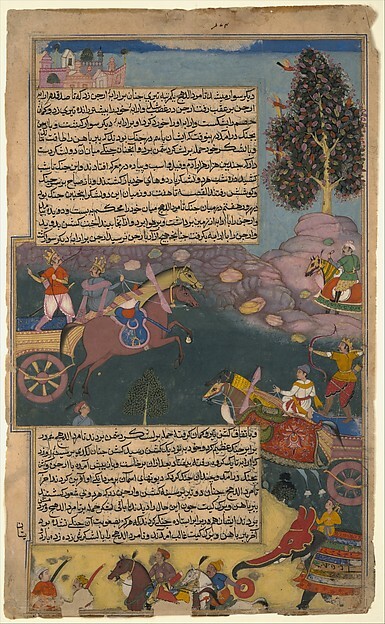 Image: “Arjuna Battles Raja Tamradhvaja”, Folio from a copy of the Mahabharata in the collection of the Metropolitan Museum of Art, 55.121.30. See the record in their online collections. Irvington High School, Girls, Inc.
Video game music always sets me in the right mood. Very unique and fits into the gameplay. I am passionate about drawing and animating. I dream of becoming an artist and/or animator and I practice drawing everyday. I would be in a Greek myth because there are many different types of heroes, villains, and monsters that come out of the stories said. I would like to be Medusa since I love reptiles and have the power to turn people into stone. Image: “Medusa kop” by Antonio Salamanca on loan to the Rijksmuseum from the Rijksakademie van Beeldende Kunsten. See the record in their online collections. The Mythos Council is a group of ten youth from across Portland who are passionate about engaging their generation with both mythology and new media. With help from 11 community partners, we took the lead in organizing a digital storytelling competition with awards and prizes up to $5,000. On June 25, we invite you to come celebrate the youth who entered and the hard work of all! Play youth-created games. Hear the sounds of your favorite video games through the stylings of a live saxophone quartet. Unleash your inner powers and document the results in our photobooth. * Eat up food and myths from around the world. Meet the other people who made this happen. If you would like to attend, please email the Mythos Youth Council at mythoschallenge@gmail.com. The event will be held in the Fred and Suzanne Fields ballroom on the ground floor of the Portland Art Museum’s Mark Building. Learn more about the Mythos Challenge: Bringing Together World Traditions and New Technologies at portlandartmuseum.org/mythoschallenge. Learn more about the Museum Play event and Youth Game Fund at GameEducationPDX.com. This Spring, the Multnomah County Library is offering STEAM education, all free, with workshops and camps by Pixel Arts. Check our calendar for Twine workshops, a Spring Break Camp, and every Saturday starting April 4th, the Pixel Pad at Rockwood Library’s Innovation Station. Join Pixel Arts mentors and get the tools you need to create your own digital interactive story, game, or mobile app inspired by mythology, oral histories and world traditions for the Mythos Challenge with Portland Art Museum. Once completed, you can sumbit your work by May 15, 2015, for your chance to be part of the special exhibition, Gods and Heroes: Masterpieces of the Ecole des Beaux-Arts, Paris. Selected winning entries will be played in the exhibition and eligible for awards totaling $5,000.Don’t miss your chance for this wonderful opportunity. Register now! The Mythos Challenge invites youth, ages 14-18, to join us for an informational session about joining the Mythos Youth Council. The Youth Council leads and manages the forthcoming Challenge. It is an amazing opportunity to gain real world skills in event production, project management, museum curation, and library sciences. Youth work with professionals from Oregon’s vibrant digital storytelling cluster. What if I can’t attend the session? Please RSVP your intent to join the council using the form below if you cannot attend. We will follow up by email. RSVP your involvement to receive announcements and information. Please enter a value between 00000 and 99999. To ensure privacy and consent, we need to know if you are under 18. If you under 18, you will be prompted for a parent or guardian's contact information. Please provide your school name and subject matter. Are you affiliated with a school or learning community? What is the name and website of your organization? Please provide name, email, and phone. More than 4000 Girl Scouts came to GirlFest, a festival with hundreds of activities including skateboarding, robotics, and crafts. “Loved the 1/1 help to understand the process. Loved the people! Fun to make game!!! Pixel Arts added games to activities with our maker kit. Our booth was constantly busy with more than 400 girls creating characters, settings, and rules for games from their unique imaginations. Many girls play games–Minecraft was mentioned frequently–but this was their first time creating a game from scratch. While Jeffrey hosted the booth with Aubrey, Megan and James, Will helmed two workshops with Leanne, Gabriella, and Alex. In the first, Digital Story Making, ten girls jumped into creating their own adventure games with Twine, a visual programming and storyboarding software. After that, ten more girls became game programmers by constructing blocks of code in Scratch, another fun and simple visual programming software. Girls were extremely positive about their experience of discovery and learning; they rated the workshops a 4.65 out of 5. New Worlds. They build games from scratch both on paper and on computers, and this series brought out many young ‘uns I’d never seen before. I had them come out to ROC and now to TDL, and both times they’ve delivered. It’s great fun for both boys and girls, and I will make sure to have them again soon.